Stop with the harmful chemicals around your home and get to keeping wasps away the safe way! Wasps are territorial and instinctively, will not build nest near another colony. The paper decoy is so realistic, it can get damaged over time like a real hive. To get the best out of your nest, please place where it is not directly exposed to rain or sun. Open up the nest by reading the instructions given within your package. Hang decoy nest 4-12 feet from outdoor living space. The nest should be placed roughly 6-8 feet off of the ground. We are so proud of our wasp decoys, we know you will be too. We offer a "No Questions Asked" 100% Satisfaction Guarantee. If you are not happy for any reason, we will give you a full refund. Click "Add To Cart" to order now and start enjoying a carefree summer! PACK OF 3 - Get more for your money and protect your home quickly and easily. 11x8 INCHES - So realistic, both wasps and other pest will believe it to be real! 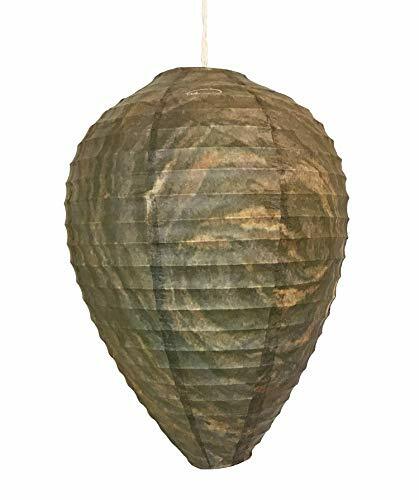 INNOVATIVE DESIGN - Hang the decoy around your home, outdoor eating area, camping spot, lawn and any other place you want clear of wasps! ECO-FRIENDLY - Stop with the toxic sprays and foams and repel wasps without harm, effectively. SATISFACTION GUARANTEE - If you aren't happy for any reason, we will immediately give you a refund. If you have any questions about this product by Patio Eden, contact us by completing and submitting the form below. If you are looking for a specif part number, please include it with your message.